NOR, accommodations info, event website and other details are forthcoming. Mark your calendars! Do you have a current set of class rules and measurements? Given the World's is in the USA, will we also have a F16 Nationals this year? There will not be a US Championships separate from the Worlds in 2014. Both the International Class President,Thomas Koenig, and the International Class Secretary, Antoine Meunier, will be in attendance. I will be relying on them to provide the latest class rules. Once the event website is up, I envision that they will also be posted there. Please advise if there is something in particular that you are unclear or concerned about Thx. Great news!!! Congratulations to Richard and Sail Newport!!! A current rule set would be helpful, I don't think there is one available online. I've never been to Rhode Island. Any locals have anything strange the rest of us should know about the area? Like ferrets are illegal or jaywalking is a felony? You're getting remarkably tech savvy! Parking downtown is a nightmare. Obey the speed limit. Find housing now, it's limited and expensive. So...where do I park my 1968 VW Camper Van?? You guys with the fancy RV's can just park them on the front lawn of The Breakers. Terry, I reached the end of the Internet, then I had to go back and start over! Newport is probably my favorite place to sail in the country. Should get a nice southerly seabreeze each day, and Sail Newport will be fantastic hosts. As Sam said, start looking for housing early as Newport gets busy in the summer. One of the guys in our fleet has a beach house nearby which might be available to rent- I can check with him. Definitely considering chartering a boat for this one- although the dates are really close to the F18 worlds which is a bummer. Rules can be found here: http://www.sailing.org/classesandequipment/20051.php (this is also mentionned on the F16 website like that). When was the ISO references put in there? Google map's suggested route takes one through the Bronx. Pulling a small boat across the George Washington bridge through what looks like a war zone sounds like too much fun. Pulling a trailer through Ny and NJ will cost you a small fortune in tolls. And to add insult to injury, you are paying to traverse some of the worst roads in the country. I would go a long way to avoid that area. Hi, below is an event update that was sent out via the class email list a couple of days ago. If you are not on that list and would like to be, just drop me a line at NZL216@gmail.com. This info is also available on the event website http://f16worlds2014.com via the "News" link. And if you're planning to come, don't dilly-dally - get registered! Payment is not due till May 15, but it helps with sponsors to see the numbers ticking over. Once again, Red Gear Racing has stepped up in a big way to the USF-16 Class. They have offered up a brand new Viper F16 for the event that will be auctioned off to the highest bidder with 100% of the proceeds going to the class. Wow, that�s incredible! Check it out the auction here. Be sure to thank Jill Nickerson and Robbie Daniel when you see them at the event. Insurance will be provided, though a refundable damage deposit is required to cover deductible. The boat will be available several days prior to the event for training in Newport. Robbie Daniel of Red Gear Racing will also be leading a free starting clinic on June 22 for all registrants of the event. Find out how to put yourself in position to get off the line fast! Also on June 21 or 22, Robbie Daniel will be conducting a free chalk talk for all registrants to discuss local conditions, racing strategy, tuning tips and more. Come and learn from the best! It�s free, how can you beat that?! Also available from Robbie Daniel and Red Gear Racing is a Racing Clinic of up to four days. If you want to finish in the hardware, there�s nothing more valuable than great coaching. Entries are limited so sign up early. Packages including housing and food are available. For details and pricing email funinthesunweb@gmail.com. Viper, Falcon and Nacra F16s will all be available from their respective manufacturers/dealers. Contact information is listed in the NOR that is posted on the event website. The organizing committee has received a number of questions regarding insurance. Please note that the event organizers cannot get involved in insurance agreements between the suppliers and users. We have been notified by Red Gear Racing and Nacra North America that insurance will be provided as part of their charter packages. As of press time, Falcon Marine was working on their offering. We encourage interested parties to contact the suppliers directly. Newport, Rhode Island is a very popular destination the fourth week of June. That being the case, lodging close by can hard to come by and expensive. Sailors are encouraged to make arrangements now. The organizing committee is aware of several groups who have pooled their resources together to rent private residences. Given the demand for rooms at this time, group rates are unavailable. If want to minimize lodging costs and avoid longer drives to/from the Sail Newport venue, get on it NOW. (There is another 100+ boat event with multiple crew that will be going on the same week). Camping is available at Fort Getty, with RV parking and hookups, in nearby Jamestown, RI (5 miles). 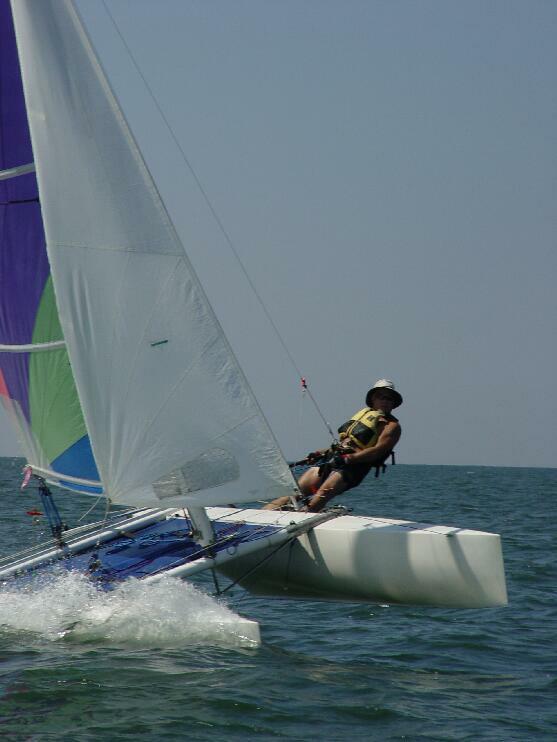 We�re going to do our best to make sure that all boats are in compliance with class requirements. The Committee may choose to measure any boat at any time. It will be the responsibility of each competitor to assure that their boat is in compliance. If discrepancies are found, the Committee may disqualify a competitor. However, protests between competitors will not be heard regarding non-compliance issues. More news and details will be coming in the weeks and months ahead. I took my F18 through the Bronx last year. Not a problem. We do A LOT of real-time navigation when traversing that section of highway; I would not want to do it solo. We literally have 2 iphones and an ipad running in real time on two separate cell networks to avoid the traffic and have NEVER made the trip from Annapolis to Newport in under 10 hours. Getting through NY is the easy part. I-95 through CT is officially the worst road in the country; it was dead stopped at 1am last year. Parking lot every time we've gone through; remember, June is beach season for New Yorkers etc. and the close beaches are in NY, NJ, RI and MA. The mountain way around the entire NY corridor is recommended if you are traveling on a weekend. Good luck with housing in Newport. Newport-Bermuda starts that same weekend and the week before is fully booked I'm sure. I can recommend staying on the Jamestown side and driving in. Worst case, Providence is a 45 minute drive to sail newport through downtown newport weekend traffic. Not terrible and liable to be far far cheaper. Sam you are way over dramatizing this. I've never heard of anyone going through the mountain route (which I assume you mean mass pike) to Newport. I've done this drive a lot and it is simple if you plan correctly. Then again even driving to the NJ shore last 4th of July weekend we had no problems at all and made it from Newport through NYC in 3 hours both ways. It's a 7 hour drive from Newport to Annapolis. Sam both times you did it was extreme traffic (flooding highways are pretty extreme and would cause traffic anywhere). Yes you may want to check traffic ahead of time, but 2 phones and an ipad... are you kidding me?! Sam, I am going to give you a hard time for that one for a while. I've gotten the drive down and honestly usually take the GW especially now that improvements have been made to the roads. But best bet for out of towners is to get to 287 to the Tapenzee Bridge. After that, if you are going through at a reasonable time, you can take 95. If you're concerned about traffic on the Connecticut Turnpike hop onto 684 to 84 to route 9 to 95. Do not drive on any parkways in CT or NY (NJ is okay) with trailers (most temping would be route 15 the merritt parkway). If you don't have a trailer take the Merritt instead of the 684 route no matter what over 95. Tolls in NJ and the bridges aren't cheap... probably $30-$35 for all of NJ and the bridge each way. Overall, I definitely wouldn't let the drive phase you. It can be a little brutal but it doesn't hold a torch to LA or San Fran traffic. As far as lodging goes, yes Newport will be expensive. Warwick (West of Providence) and Fall River (east of Providence) and Middletown (north of Newport) will be the cheaper if you book soon, if you wait they won't be much cheaper. Ever camped at Ft. Getty? No but I've been there as we hosted a Club 420 North Americans there. But keep in mind the toll to go over the Newport Bridge each way is a few bucks. On Aquidneck Island (Island newport is on), you may want to check out the following. But I really know nothing about them other than they are there. Both are probably 10-15 minutes from Sail Newport and an easier drive than dirving from Jameston. Off Rt. 114 in Portsmouth. 133 sites, fishing, playground, safari field, beach access. 44 trailer sites, immediate access to Second Beach. 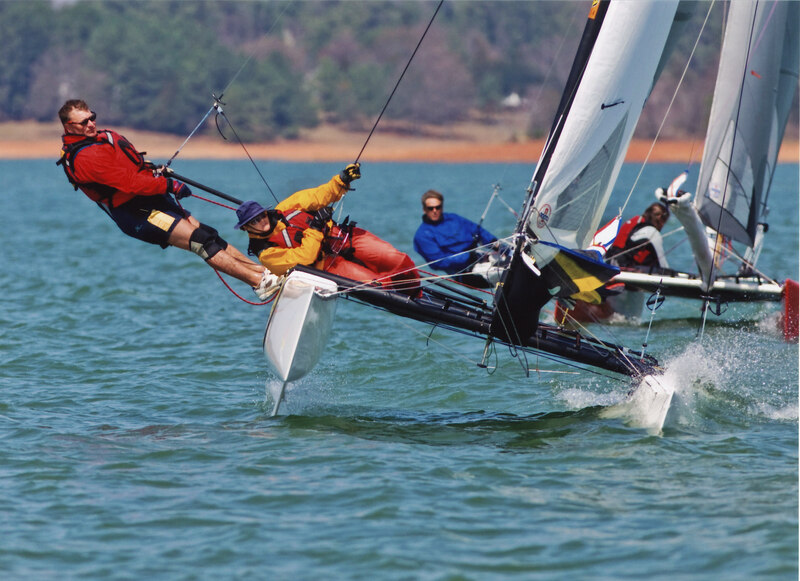 Todd, when is the last time you took your boat down to the Chesapeake to come race and enjoyed the pleasant drive? Please don't let this little sh$t fight prevent you from racing F-16 Worlds, or the drive. Todd is right, if you plan accordingly you will be fine on the drive and enjoy a pleasant time in Newport. It really is one of my favorite places in the world during the summer months, mild weather, great sea breeze, plenty of eye candy, ocean sailing. Just make sure to book lodging now and remember to call your friends that sail in the NE for recommendations (not me!). Oh, and most importantly have fun! Last edited by samc99us; 03/20/14 12:59 PM. On Saturday morning you should have no problem going over the Tapenzee to the Merrit Parkway (if you don't have a trailer) to New Haven. I wouldn't bother going up through Danbury. Honestly 95 would probably be ok on Saturday morning but not worth it if you don't have a trailer. I currently have a boat for sale before or just after the event depending on interest. 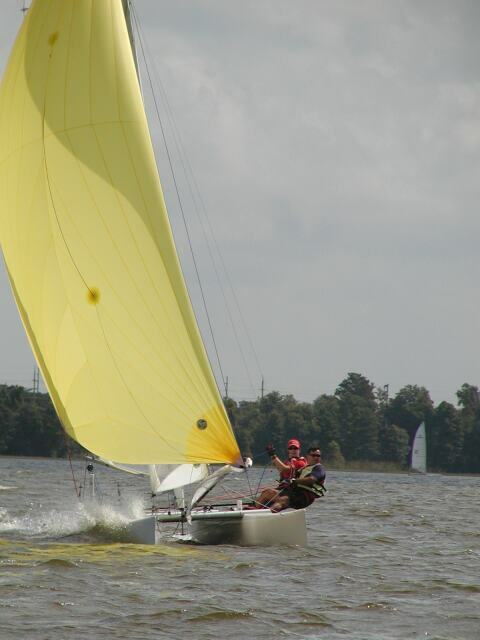 It is the 2012 AHPC (Goodall Design) Viper that I sailed last year at the Nationals in Racine with the stylish blue decking, mainsail with blue luff, and matching blue spin. Possible delivery of the boat depending on location. 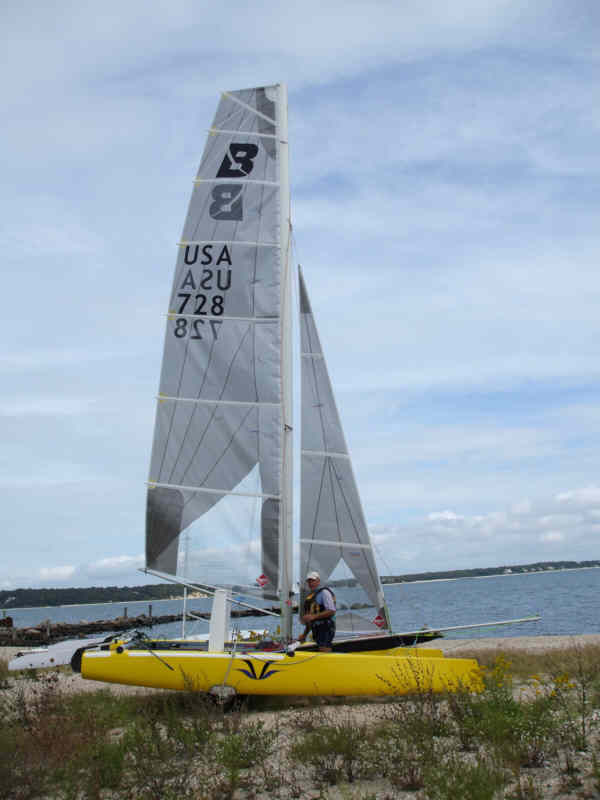 This boat would be great for the worlds as several upgrade options are available and it is race ready, complete with tuning marks, settings, advanced adjustable trapeze setup, and other small tweaks. Beams have also been re-seated so it is a very stiff platform. This is a fast boat and has proven itself before! 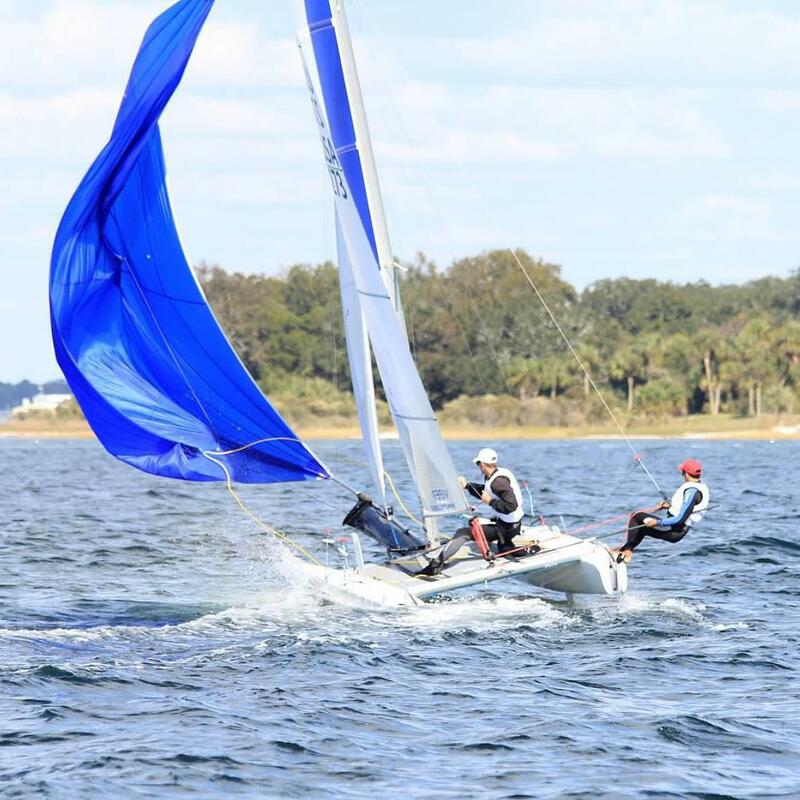 1st in the 2013 F16 Nationals, 1st in 2013 US Youth Champ., 1st in 2012 Buzzelli Multihull Champ. The route over the TZ bridge is 287. the merritt pky is #15. As you go over the bridge you'll get a nice view of all the cranes they have set up for the construction of the new bridge. I just got back from pulling a 35' trailer up and back. Joanna -from Allentown, take I-78, I-287, I-87, I-95 and you will be fine. How rough does that bay get? 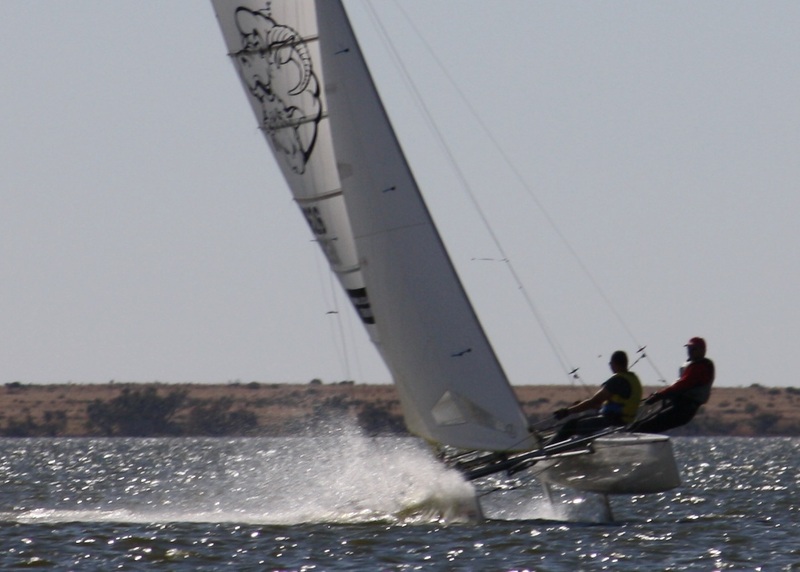 I singlehanded Nationals last year for the first time, and the one thing that become clear was when its rough and light, the extra mass helps keep the boat rolling in the slop. I'd be trucking along and just get parked from waves if I wasn't uber careful going to weather. The other thing is when the wind was up, I couldn't get enough speed up in the rough stuff to move the apparent wind around and I'd just get hammered by the gusts. Constantly burying the nose and capsizing. Shattered my top ten dream that last day in Racine. Not that there's anything I can do about it, just curious. Most of the racing I've done in Newport (when the F18's let me play) has been north of the Pell Newport Bridge. Its pretty protected. The biggest waves I've encountered are from the stinkboaters. The NOR isn't specific about the location so they still could take us outside the harbor if they want to. There still is current to deal with. Looking forward to getting some training in Newport in the coming month. Last edited by tzilinski; 04/03/14 09:07 PM. Do any of you Yankees have any ideas on a good bus service from JFK up to Newport? I've seen Peter Pan, but that runs out of 45st. in NYC. I'm guessing there must be a bus/metro/subway from JFK into the city? Why do we only have 23 boats registered right now? Are there any other regattas or scheduling conflicts at the same time? We should be having a very large turnout for this regatta since over 30 teams attended last year's worlds! We would go, but can't justify the expense of the charter for a small fleet. Chicken and egg problem. It's good to see Ken Marshack up there. Redress given to Robert Brunger due to damage sustained in a collision with another boat. Four more races today, quite shifty and challenging for all. Somewhat lighter breeze, with enough puffs and shifts to keep everyone on their toes. Suffice it to say, challenging conditions have caused a number of breakdowns, both physically and mentally. Two days in, two rescue swimmers needed to help right boats (one was a local Hobie 16 sailor, friend of mine). Lots of cool wipeouts, and some separated crews. A great job by all of the RC boats keeping up with the mayhem. Several competitors who were done yesterday came out in wetsuits to help on RC boats today. There are two great coaches who are also invaluable this week: Jill Nickerson and her team from Red Gear Racing, and Jim Zellmer who is currently coaching in Sarasota, but has been a longtime racer in New England. For the past two days, a rather large (moored) tanker has taken some options away regarding course length (and affecting number of laps). Jeff thinks sailing around this thing is fun, no one followed... It's scheduled to depart in about an hour from now, shouldn't be a problem on Thursday. Eight races completed. Seven more races in the schedule. They get another discard after one more race. Apologies for not posting live updates from the water. We've had our hands full, and are fully committed to the quality of the races. Broken spin cleat during the first 2 races. Made a repair on the water and worked hard to make up the points! Also happy to announce that Benjamin Amiot (French F18 nationals champion) will sail the Falcon F16 during next week Europeans! 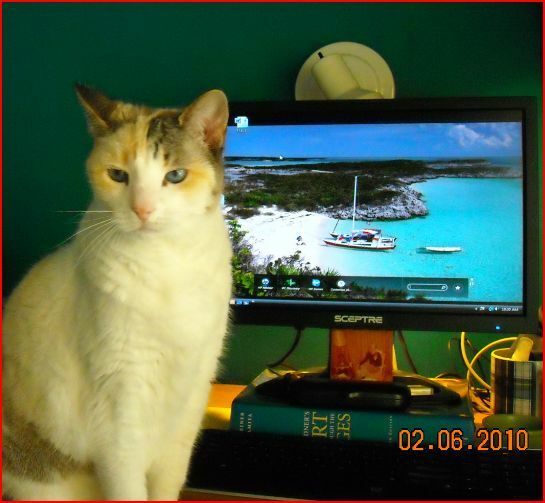 Scuttlebutt is published each weekday with the support of its sponsors, providing a digest of major sailing news, commentary, opinions, features and dock talk�with a North American focus. The maxi-trimaran Spindrift 2 left La Trinit�-sur-Mer, France on May 26, arriving on June 3 in Newport, Rhode Island where the team has remained on standby to break the crewed 2880 nm North Atlantic record from New York to Lizard Point. Led by co-skippers Dona Bertarelli and Yann Guichard, they seek to better the record of 03:15:25:48 set by their 40m (131.23-feet) trimaran in August 2009, known then as Banque Populaire 5. To be successful, their average speed must be in excess of 32.94 knots over the distance. But now, after seven weeks on standby in Newport, there has still been no suitable weather window for which to launch their assault. As Guichard explains, these accomplished sailors have no choice but to accept the wait, unusual as it may be for an elite sportsman. �Despite enduring the standby at home, as opposed to on the quayside, we are fully alert and mentally ready to drop everything and jump on a plane as soon as possible,� explains Yann, who sends a message to his teammates every day to keep them informed about the latest conditions. Among the obstacles blocking the route has been drift ice in the Labrador Current. A harsh winter has meant that icebergs are lasting longer than normal, and while they are slowly melting, the large ice sheets are only disappearing gradually from satellite photos. The other obstacle has been the Azores High, an anticyclone centred over the Azores and spread like an insurmountable mountain across the entire North Atlantic.